Overall number of anti-state militant attacks in Pakistan has declined in 2013. However, a slight increase in Khyber Pakhtunkhwa and unprecedented escalation in Sindh was observed during the year. Overall reduction in militant attacks was 10%. Most significant reduction was observed in Balochistan and FATA. In Balochistan militant attacks declined by 29 % while security situation also improved in FATA where 22% reduction was observed. In Sindh, 138 % increase in militant attacks point out gravity of the security situation in the province mostly in Karachi. Majority of the victims in militant attacks were ordinary civilians while security forces also lost hundreds of their personnel during the year. The conflict Monitoring Center has recorded 1144 militant attacks during 2013 in which 2595 people were killed and 5035 injured. The dead include 1402 civilian (54%), 623 militants (24%), 523 security forces personnel (20%) and 47 Razakars (2%). Among the injured, 3891 were civilians (77%), 928 security forces personal (18.5%), 173 militants (3.5%) and 43 Razakars (1%). Although the number of militant attacks dropped in 2013, however increase in resultant deaths and injuries made it more lethal year than 2012. Rise in deaths and injuries were a result of rise in suicide attacks and subsequent deaths. In 2012, militant had carried out 28 suicide attacks, which killed 194 people while 47 suicide attacks were carried out in 2013 killing 699 people. Improvement in security situation in FATA was visible from the fact that number of militant attacks as well as resultant casualties both had declined during the year. Civilian deaths in FATA declined by about 44 percent in 2013 compared to 2012. 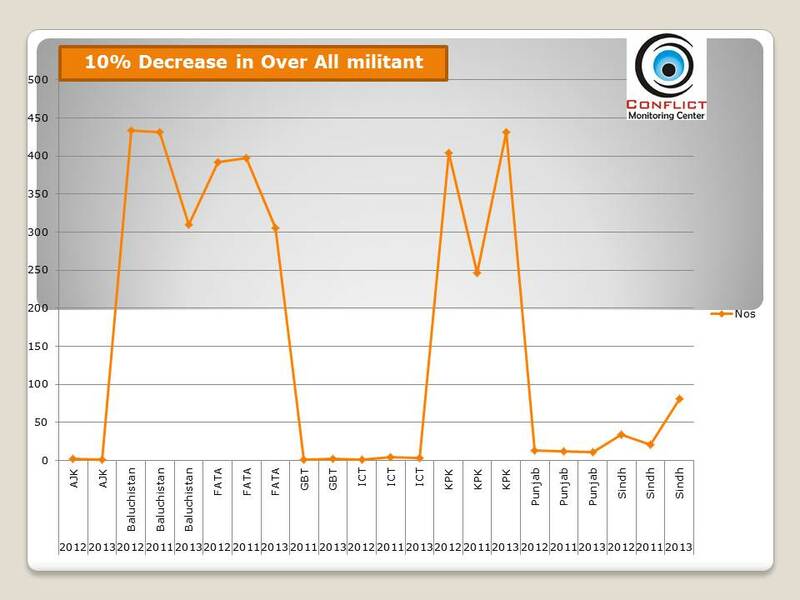 Decline in militant attacks in FATA can be attributed to some developments took place during 2013. Most significant was military operation in Tirah Valley of Khyber Agency. CMC’s data shows that in 2012, 67% of militant attacks in FATA were recorded in Khyber Agency. Military operation in Tirah Valley in April 2013 and consistent pressure on militants in other parts of the Khyber Agency resulted in at least 42% drop in militant attacks in the Agency. A remarkable 70% decline in resultant deaths was also recorded in the Agency. It is pertinent to note that Khyber Agency is strategically more important than other Agencies of FATA as it is adjacent to Peshawar, the provincial capital of Khyber Pakhtunkhwa province as well as lies in route of major NATO supply through Torkham border. Higher number of Inter group fighting of different militant groups active in Khyber Agency were also recorded during 2013 which has further weaken militants operating in the area. Militant attacks in FATA also saw a decline after backdoor efforts initiated by federal government to bring TTP to participate in peace talks. Not only militant attacks but also a downward trend was observed in security forces actions in FATA until December when North Waziristan saw escalation in hostilities by militants and retaliatory actions by security forces. 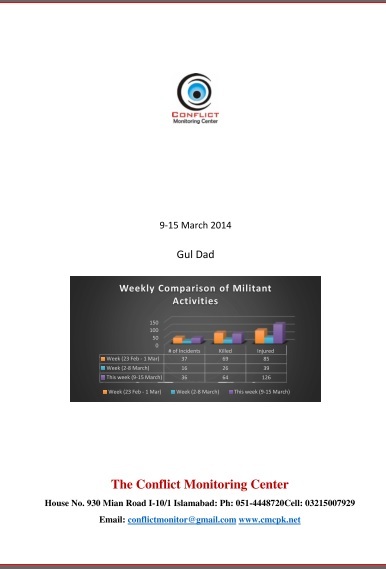 In Balochistan, average militant attacks per month dropped from 36 to 25 in 2013. 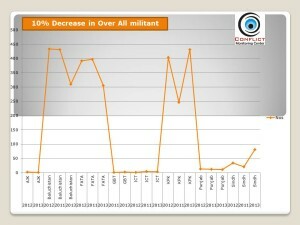 The downward trend in militant attacks in Balochistan had started during last quarter of 2012 and continued in 2013. The security forces have increased their activities against militants in Balochistan during the year, which can be a factor in decline in militant attacks in the province. It was observed during 2013 that TTP have expanded its operation in Karachi. Previously it used to use the city for financial and logistic activities but now the group has started to conduct militant operations on regular basis in the city. It has also established safe havens in different parts of the city. Improvised Explosive Devices (IEDs) constituted majority of the militant attacks during the year. However, 12% drop in IED attacks was observed in 2013. The number of physical militant assaults also dropped by 20% in 2013. Suicide attacks have increased during the year by 40 percent. 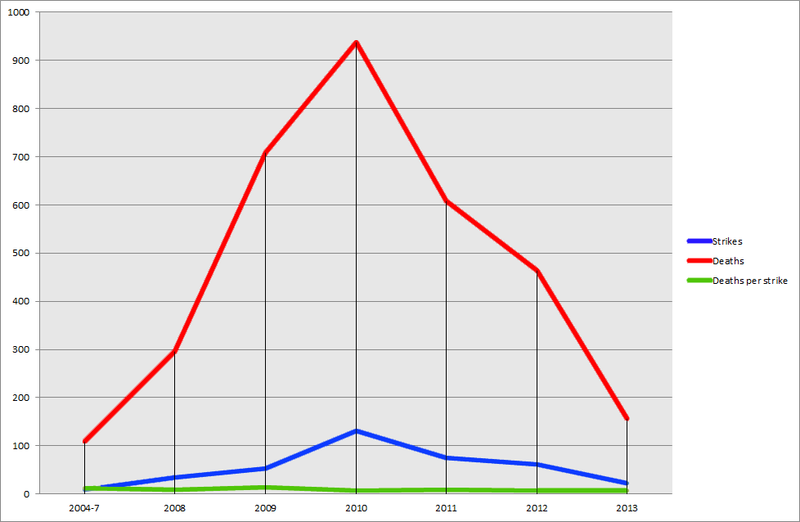 (28 in 2012 and 47 in 2013). Higher number of deaths in anti-state militant attacks in 2013 was mainly because of higher number of deaths in suicide attacks during the year. Apart from statistics of deaths and injuries in suicide attacks, rest of the data shows lesser number of casualties than 2012. After ‘All Parties Conference’ convened by Prime Minister Muhammad Nawaz Sharif in September 2013, an unannounced ceasefire-like situation had developed in FATA from security forces’ side. The CMC also observed that no escalation of militant attacks took place after Hakeemullah Mehsud’s death in a drone attack. At least 847 people were killed in 431 militant attacks in KP, 305 such occurrences claimed 803 lives in FATA, and 680 persons became victims of 310 such incidents in Balochistan. In Sind and Punjab, 81 and 11 militant attacks claimed lives of 225 and 21 people, respectively. In Gilgit–Baltistan, 14 people were killed in two militant attacks while three such attacks took lives of two people in Islamabad capital territory. In Azad Kashmir, a single violent militant activity was reported claiming lives of two militants. More than one-half of the victims of militant attacks were non-combatant ordinary persons, i.e. civilians, as their number among the killed and injured stood 1402 and 3891, respectively. Out of them, 525 were killed in KP, 469 in Balochistan, 216 in FATA, 168 in Sind, 13 in Punjab and 11 in Gilgit–Baltistan. The militant attacks also claimed lives of 523 security personnel, including 177 in KP, 153 in FATA, 143 in Balochistan, 41 in Sind, 3 in Gilgit–Baltistan and 6 in Punjab. These attacks also cost lives of 622 suspected militants; 408 in FATA, 132 in KP, 61 in Balochistan, 16 in Sind, 2 each in Azad Kashmir and Gilgit–Baltistan and one in Punjab. The militants killed 797 people and left 2505 others wounded in 474 IED explosions. They claimed lives of 684 persons and injured 588 in 349 physical assaults while 70 people became victim of gunfire / targeted killing in 52 such incidents. The militants also kidnapped 162 people: 79 in Balochistan, 45 in FATA, 36 in KP, and one each in Sind and Punjab. At least 35 people including 29 civilians and 6 security personnel were killed after being kidnapped by the militants. The militants carried out 47 suicide attacks taking lives of 699 people, including 451 civilians, 129 security personnel, 115 militants and 4 pro-government Razakars, and left 1582 others injured including 1347 civilians, 225 security personnel and 10 militants, wounded. The security forces took 550 actions claiming lives of 1028 people, including 884 suspected militants, 94 civilians and 50 security personnel. The highest, 221 security actions, and 32 resultant deaths were reported in KP while highest i.e. 873, deaths in such actions took place in FATA in 144 security actions. In Balochistan, 103 security actions claimed lives of 94 people while 23 people were killed in 28 such cases in Sind. In Punjab, 47 security actions took four lives while two persons died in 10 security actions in Islamabad capital territory. In Gilgit–Baltistan, 6 security actions but no casualty was reported. The forces detained at least 3094 suspected militants; the highest, 1184 in KP, 729 in Punjab, 706 in FATA, 314 in Balochistan, 123 in Sind, 23 in Gilgit–Baltistan and 15 in Islamabad capital territory. The forces foiled at least 163 attempts of subversion, by defusing IEDs. Out of them, 103 such attempts were foiled in KPK, 28 in FATA, 24 in Balochistan, 5 in Sind and 3 in Islamabad capital territory.